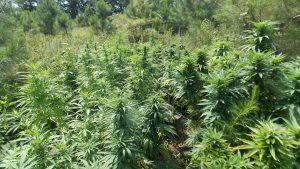 A total of 116 marijuana plants were seized from two different locations in Johnston County on Monday. The Johnston County Sheriff’s Office was aided by the NC SBI and NC National Guard for an aerial marijuana eradication campaign. Agents said they found 100 plants growing near the 500 block of Red House Road east of Smithfield. An additional 16 plants were found in an undisclosed location off Highway 42 west of Clayton. The plants had a potential street value of $232,000. As of Tuesday no arrests had been made however Sheriff’s Captain Jeff Caldwell said both cases remain under investigation.